And you needn’t have a spooky mansion, eccentric tastes or a now-it-puts-the-lotion-in-the-basket creepiness to you to have a secret door either. 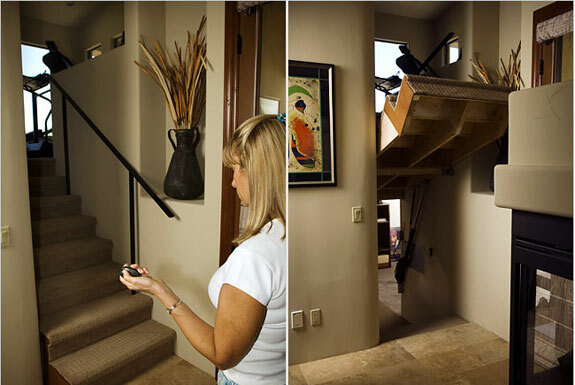 There are several reasons why you may want to consider having a hidden door in your house. Primary among those reasons: space efficiency. 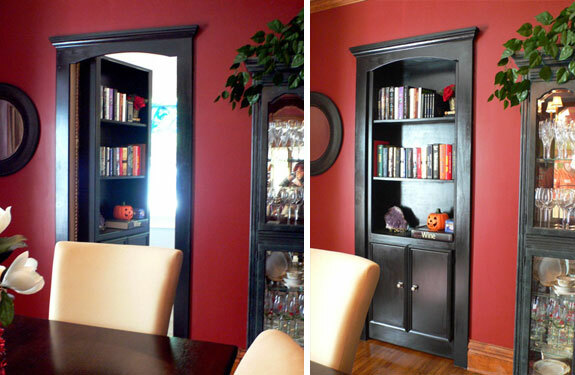 A normal door occupies wall area that could otherwise be used for, say, a bookshelf. 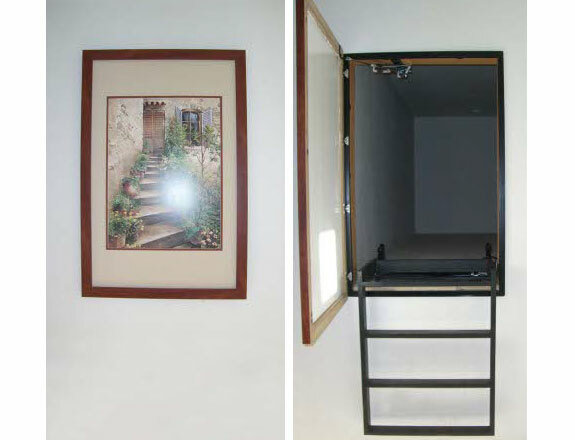 Do you have a room or storage area you don’t need frequent access to? 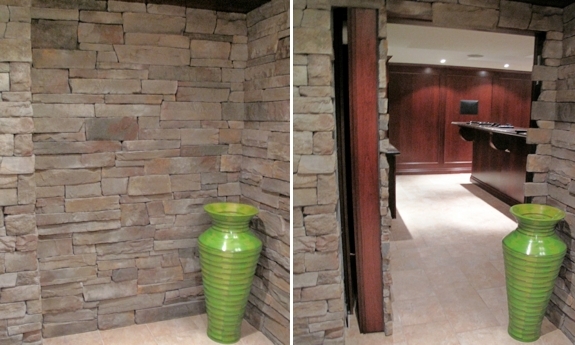 Hide the entrance to it behind a fireplace, staircase, mirror, wall panel or a painting. Some people have hidden doors for security reasons. To conceal a vault, for example. Or to hide a panic room made popular by the 2002 Jodie Foster flick. 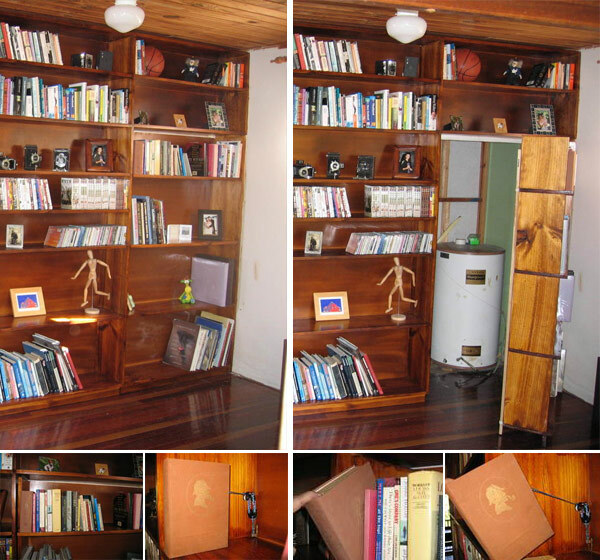 Mostly, though, we think there’s something about a hidden door that’s magical — and exceptionally cool. Check out the photos, below. 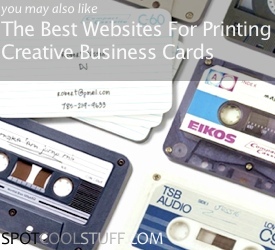 Creative Home Engineering — Spot Cool Stuff’s favorite hidden door company. They have the most creative designs and build all types of hidden entryways included armored doors and doors with biometric access control. 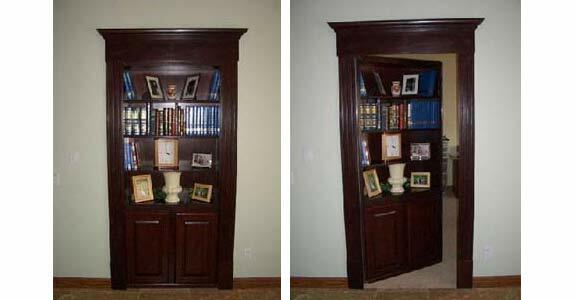 The Hidden Door Company — Specializes mostly in bookcase hidden doors but will manufacture designs specific to your situation. 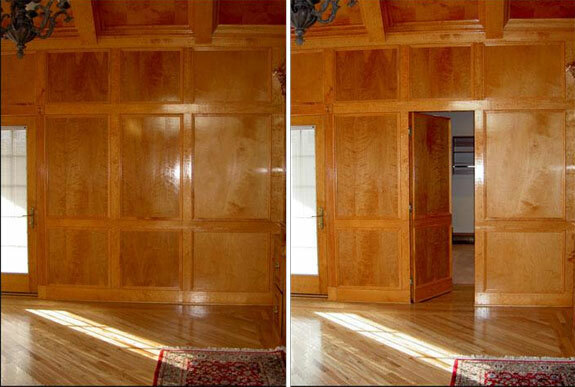 Niche Doors — has high-quality pre-built hidden doors made of wood. 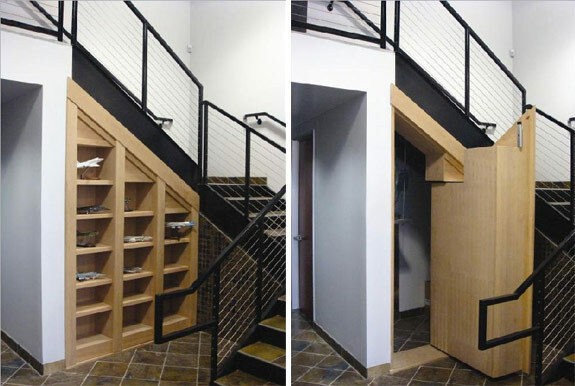 Hide A Door — offers some of the most inexpensively priced hidden doors. Their website has a form where you can request a free quote. Space San Diego — deals with an array of space saving and optimizing furniture, not only hidden doors but also Murphy beds and stacking stools. 5 related posts . . .
Yoyoyo recently posted..Build Your Dream NOW! WOW. Brilliant job man. I just love the mind creativity. Those Doors are amazing.. They are being used as bookshelves, and some are hidden like it was just part of the wall, I am very awe struck to see fabulous doors designed this way.. 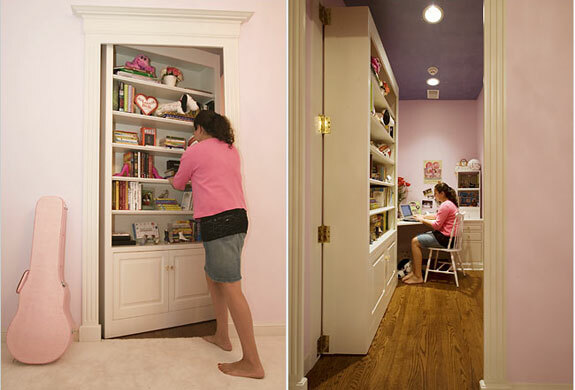 So surprising list of secret doors! At home, we don’t have one, I still cannot figure out where would I put a secret door! Wonderful Blog- These are really amazing pics of the doors, it is useful to make beautiful internal part of home. how much would you say this would cost to build? the display cabinet that is a door…the white one?…. You’d have to contact the manufacturer directly about the most current pricing—click on the photo of the product you are interested in. I love these ideas…I would love to have a little secret hole behind a picture to store some of my valuables…it would be cool. 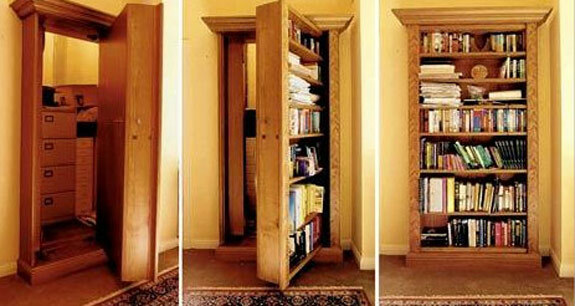 I also like the idea of having a door be a bookshelf too – a nice hiding place away from the kids haha! Marie recently posted..Latex Vs Memory Foam – Which Foam For Your Mattress? didn’t think we could get these for our own homes.. so want to install the fireplace one! Amazeballs! Perfect for my spooky mansion! I’m going to design an entire apartment based on this concept of swinging walls. You can reconfigure the space however you want. It was good to see these really great and unique ideas for the home. I like the fact that the book to pull to open the bookshelf door was Sherlock Holmes..
Wow simply rocking gr8 ideas. The hidden passage under the stares would most definitely go good in my house and in my opinion is the coolest hiding place to have because not very many people have one unless there rich or what ever and because no one would think to look there. where could someone get the “diy” plans to build something like this in their own home? At some of the websites we linked to you can order the door and install it yourself. The thing is, because every house is different it isn’t really possible to have a standard set of instructions that would work for everyone. WWWWWWWWWWWWWWWOOOOOOOOOOOOOOOOOOOOOOWWWWWWWWWWWWWWWWWWWWW!! I LUV THAT SO MUCH!! HEE HEE!! totally wicked!!!!!!! i wanna room like that!!!!!! !